Extreme humidity or dryness is harmful. Sudden changes of environmental conditions from dryness to humidity or vice versa must be avoided at all times as this can cause cracks in the wood regardless of how well cured the wood is. Stringed instruments should never be hung from the wall as humidity which gathers on the wall can be transferred to the instrument. Excessive humidity can soften the glue and cause the woods to separate. Wood is hygroscopic material which easily absorbs or expels moisture according to the climatic conditions. lt is recommended that you keep your instrument between 40-75% relative humidity of the air. When the humidity is less than 40% the wood could crack and the action change. When the humidity is greater than 75% the glue might soften resulting in loss of sound and buzzing due to lowering of action. When the guitar is transferred in the luggage compartment of a plane the strings must be loosened completely. It is recommended that the instrument should be wrapped in silk material inside the case. Guitars must never be placed in the boot of a car in sunny conditions, as temperatures can reach up to 75°, which would cause the instrument to burst. The recommended action for the classical guitar is 4 mm. for the sixth string and 3 mm. 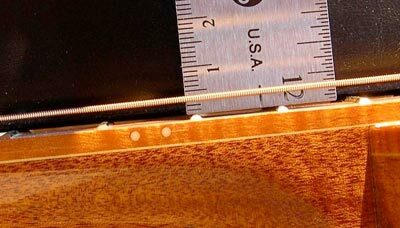 for the first string, taking as a reference the top of the 12th fret and the lower part of the string whilst the instrument is properly tuned. The instrument must always be properly tuned; when changing strings they must always be tuned up to pitch. At no time should all the strings be removed together as this would cause the top to lose ten­ sion. Each string should be replaced individually. Due to hand perspiration wound strings tend to lose sonority. This can be remedied by removing the strings and putting them back in reverse if this insufficient the strings can be washed in soapy water and replaced when absolutely dry. lf the strings develop a sudden buzz when played open it is probable that the winding has lost its original tension or the groove of the nut has deepened. This can be corrected by changing the strings in the first instance or placing a thin piece of cardboard under the nut if the instrument has been ex­ posed to excessive humidity similar faults can develop. Although it is not of great importance when a small crack appears either on the top or back of the instruments it should be attended to by the manufacturer or an experienced repairer. When the crack is on the top, loosen the strings immediately. 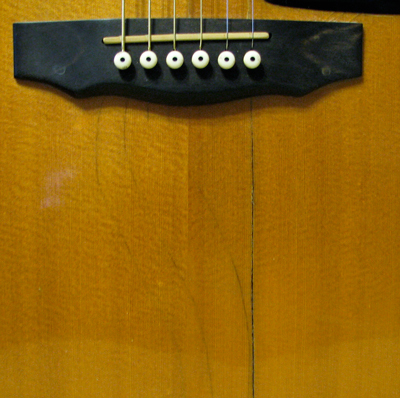 lf, as a result of excessive dryness or age, the frets overlap the edge of the fingerboard it is necessary to file this excess away. Although this is a very simple job it is advisable that it should be done by a fully experienced repairer. 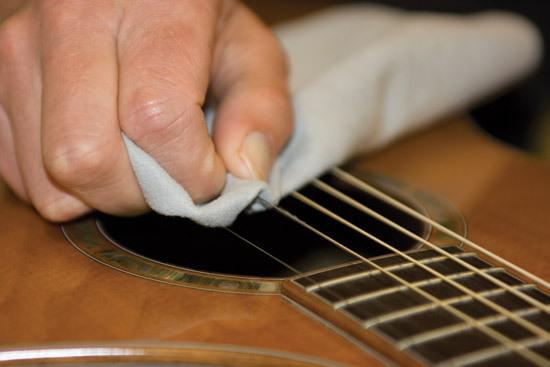 To clean a spot on the varnish rub with a soft soapy cloth. Due to the fact that some varnishes are incompatible, should deterioration of the varnish occur it is advisable for any remedial work to be carried out by the original maker. 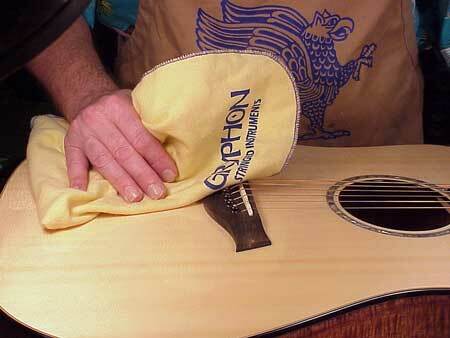 Posted in Acoustic Guitars and tagged guitar care, guitar maintenance. Bookmark the permalink.